The bulk of the participants and the predatory sea voyages Viking raids were common warriors, armed with an ax, spear and shield. 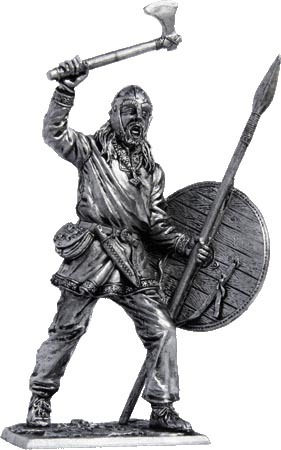 It was Karl - freeborn Scandinavians, representatives of the largest social group of Vikings. Carls had his own farm, which passed by inheritance to the eldest son. Younger sons had to take care of themselves, so they joined the troops of robbers and became professional soldiers. Summer clothes Vikings were a shirt and pants of the unpainted material. In winter, he could put on another shirt and a cloth cape. This warrior also has an iron segment helmet with the protection of the nose, eyebrows patch, and leather earpieces. On his neck hangs an amulet in the shape of a hammer Thor. Notify me of updates to Viking with spear and ax, 9-10 cc.